Contamination happens easily: all it takes is one person to put any item in the wrong bin. That's why having on-site volunteer monitors to assist event-goers is vital to pulling off recycling and composting at events. And no longer do you have just trash containers. Create Sorting Stations featuring recycling, food scraps and trash. 1) Determine how many volunteers you need. Create a map of your event for determining number and location of sorting stations, and identify where and when people need to be assigned. 2) Recruit Staff/Volunteers. Reach out to your community groups or local businesses. Use social media, Front Porch Forum, newspapers, your email lists and website, to get the word out. Create a free sign up form using Google, or your own website platform to create a database of interested volunteers. 3) Train and Schedule. Now it's time to get a commitment. Let your volunteers know when and how long they will be required to work for, and what will be provided to them (free ticket, snacks, t-shirt, training, etc). Set-up a training date to go over your venue map, schedule shifts and delegate roles, and work out all the details of your event with your team. 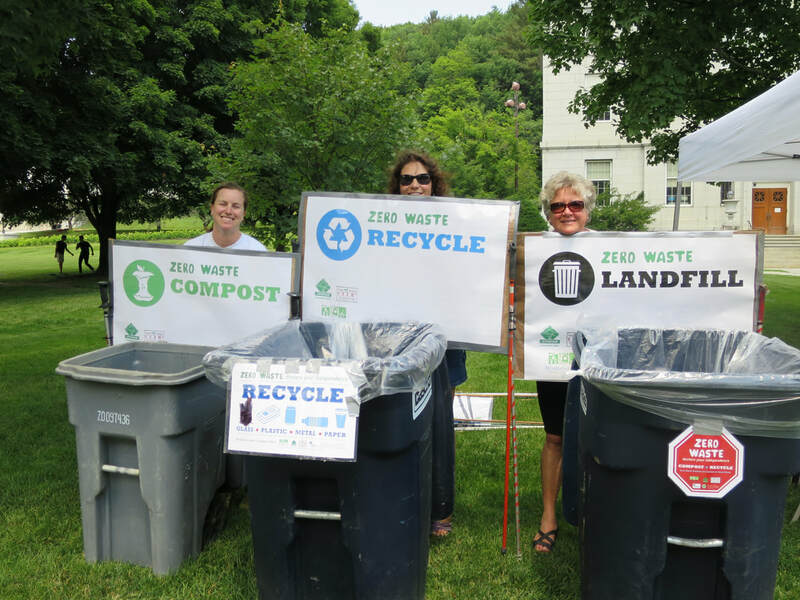 Volunteer & Staff Training for "Zero Waste"
​Recycling in Vermont - a quick list. Interested in becoming a Waste Warrior? Want to be a part of preventing waste where it happens!? We will be training volunteers to assist at local events in the 2018 season. Print our Quick Tips for what goes into each bin, for your staff and volunteers. FAQ: Here's printable information on Frequently asked questions on "Zero Waste", definitions, and common questions.